WARNING: If you’re new to the series, this is *not* the story to start with. Everyone in the series is mentioned and interact and, well, it’s crazy fun for fans of the series but will be pretty confusing to newcomers. 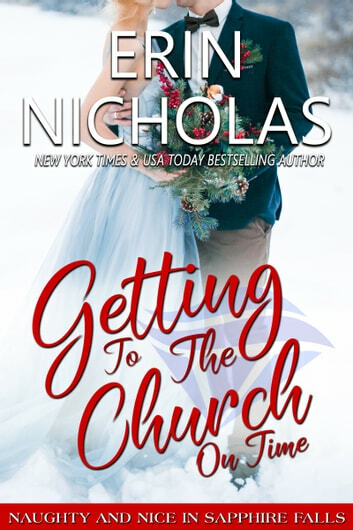 Also, there are spoilers J So, if you want to take a holiday trip to Sapphire Falls for the first time, check out Getting In the Spirit, the first Sapphire Falls Christmas novella! Happy reading! Oh how I love visiting Sapphire Falls, a Christmas wedding even makes it more special. The big question though who is getting married. Levi and Kate were suppose to get married but a big snow storm has separated them. Levi has now offered a contest to the Bennett brothers, for one of them to use their wedding date. I will not give any spoilers, other than there is plenty of candy canes, hot chocolate, peppermint cheesecake and brownies. Oh I forgot the best part, plenty of romance! It was great to catch up with everyone in Sapphire Falls. I do not recommend this story if you have not read the other books in the series. I highly recommend this book for an afternoon of fun and romance this Christmas season. Okay, can I just say LOVED IT, LOVED IT, LOVED IT over and over? Because I had a smile on my face the entire time I was reading GETTING TO THE CHURCH ON TIME unless of course I was laughing out loud. Erin Nicholas has written a delightful gift to her Sapphire Falls series fans just in time for the Christmas season. This fun novella includes all the couples I have come to love and is told in a span of a little more than 24 hours, the anniversary of the day Levi and Kate met. The day they planned to be married in full-on Sapphire Falls style. If you haven’t read the previous books in the series you really should get right on that, but you should also know GTTCOT is full of spoilers and not the book to start the series with. It just can’t be fully appreciated without at least the backstory of Levi and Kate. For those of us who are fans, well it’s simply wonderful to head back to our favorite perfect little town. I for one enjoyed every moment. Thanks Erin Nicholas!! 5 stars!